By walking the Amazon from source to sea, Ed Stafford completed one of the last epic, undone adventures. 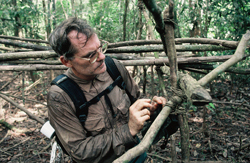 Scott Wallace has written for NationalGeographic and National Geographic ADVENTURE magazines about uncontacted tribes of the Amazon. He is working on a new assignment on this subject. The recent publication of the photographs of naked Indians poised to fire arrows at a low-flying aircraft electrified the world. Most found it incredible to think there are still communities out there beyond the reach of the so-called "civilized" world. In fact, those Indians belong to one of an estimated 60-70 groups of "uncontacted" indigenous tribes that still inhabit the deepest recesses of the Amazon rain forest, along an arc that roughly parallels Brazil's western border with Colombia, Peru, and Bolivia. Subsequent revelations that Brazil's Indian affairs agency, called FUNAI, had known for decades of the existence and approximate location of that particular group of Indians do not alter the basic facts: these are people who have had little or no contact with the outside world. Though they live within the boundaries of Brazil, they have no idea what Brazil is. They've never heard of Jesus Christ, Christopher Columbus, or Osama bin Laden. Because they are still uncontacted, they've never been exposed to the germs that Europeans first brought to the New World 500 years ago. As so-called "virgin soil populations," they remain highly vulnerable such illnesses as flu, measles, small pox, even the common cold. It is possible to know of the existence of such tribes, to even know where a particular group is located and roughly how many members it has without making contact with them. That is the guiding principal behind the policy Brazil has followed over the past 20 years with respect to its isolated Indians: locate them, protect their lands, monitor them, and prevent unwanted contact. "Uncontacted" in this context does not necessarily mean that the group has no idea that an outside world exists. They almost certainly and invariably do. In fact, most uncontacted tribes are believed to be the descendants of the survivors of massacres perpetrated in the late 19th century by slavers who sought to press-gang Indians in the western Amazon into tapping rubber for the booming latex industry. Those who escaped the bloodshed and brutality fled into the Amazon's deepest recesses and continue to shun contact with the outside world.